In 2008, when the risk of tsunami was again considered, an expected tsunami exceeding 15 meters was projected for the Fukushima No. 1 nuclear power plant. But Tokyo Electric Power Company (TEPCO) officials dismissed the figure as hypothetical. A second study in 2008 using different modeling suggested wave heights of nine metres, but again TEPCO officials disregarded the findings. http://www.abc.net.au/unleashed/3760422.html "Can Japan do better than Chernobyl?" Maximum design basis was water level of 5.7m. The plant was planned to be way out of harms way at 10m (30 ft) perched up on a hill, but the water reached up to 14-15m, nearly to the top of the 1st floor. Units 5 and 6 were up 13m so they were partially threatened as well. 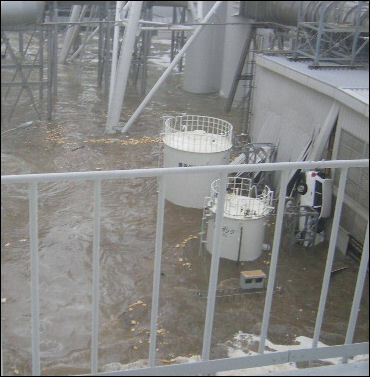 by John Johnston on 04/10/2011 This photo shows that when the waves crashed against the turbine buildings, water splashed hundreds of feet into the air, about halfway the height of the stacks, much higher than the roofs of the 5 story high reactor buildings which are 30 ft in the air to start. Huge oil storage tank near the shore is washed up between buildings blocking the main driveway. A boat is overturned not far from the oil tank , visible from helicopter overflight and google earth, but nobody notices it except Asian Week. Cars and trucks are floated up and upturned all over the site. Another employee catches video of wave crashing against turbine building - water is thrown high above the reactor and turbine building roof lines. Event: Two workers drown in turbine building " They were reunited at the evacuation center with a woman TEPCO employee, who burst into tears when she saw the couple. 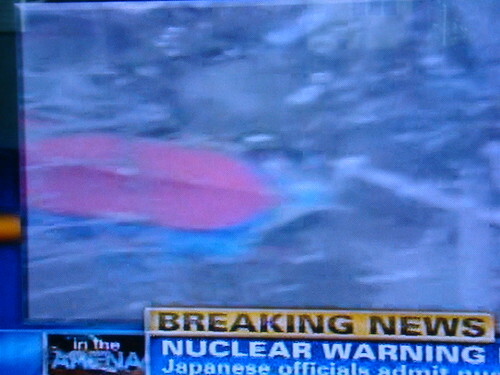 he told them a senior at work, who worked at the Fukushima plant, had been swept away by the tsunami. The employee went to the turbine building to check on damage when the tsunami hit. The woman extended her hand and shouted, "Get up here now." However, the senior employee did not make it. link They would be declared missing, but the two workers would later be found drowned in the basement of another turbine room. 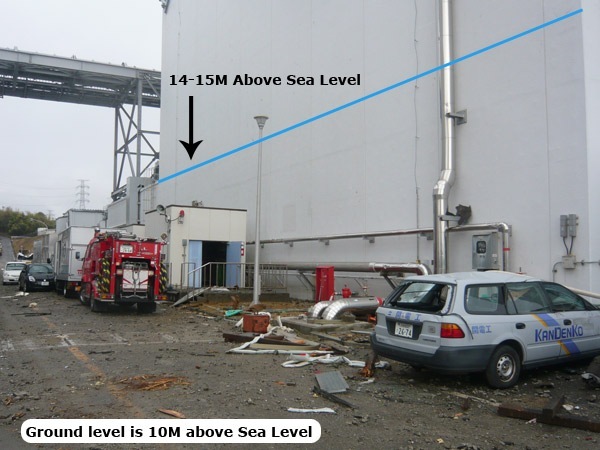 Event: Tsunami damage summary: Financial Times They swept over the plant’s 5.5m-high concrete sea wall, breaking it in places, then surged across a narrow seafront road and crashed into buildings containing turbines and, behind them, the reactors. External pipes were ripped from walls, workers’ cars were washed away and a tanker truck knocked on its side. 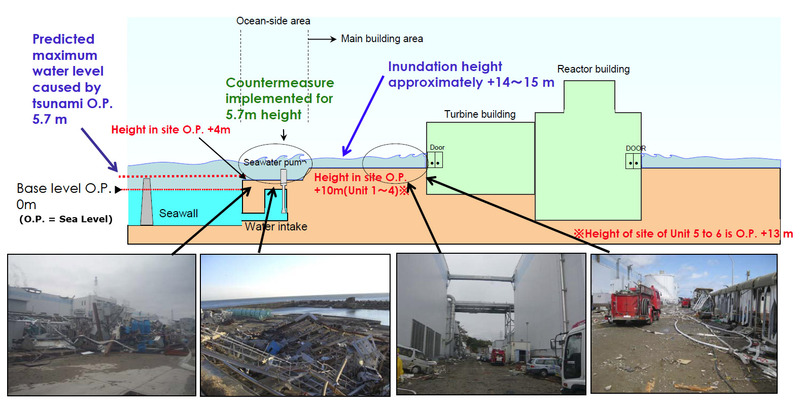 The tsunami reached more than 14m above sea level – roughly the height of a five-storey building – and the four lowest-lying reactor buildings were surrounded by swirling seawater 4-5m deep. At a hearing into the March disaster, a chief operator described how he realised disaster had hit when lights flickered and went out, including those on the control panels, according to an interim report released Friday "I came to realise a tsunami had hit the site as one of the workers rushed into the room, shouting 'Sea water is gushing in! ''', the unnamed chief operator was quoted as saying. As this NEI report diagram shows, the water went to the very top of the first floor of the reactor. Not reported, but obvious from this diagram is that the disaster would have been even worse had they gone 1 floor higher and flooded the 2nd floor control room, drowning the skilled operators and managers in control. The emergency diesel generators in green and switching gear rooms in yellow were on basement levels. The generators and seaside intake structures were all completely submerged. The reactor building is on the left, turbine buildings on the right. Aftermath shows water above 1st floor 30 ft from sea level. This appears to be the first report that IC were not operable, most reports are that they were shut down manually, then could not be restarted because of lack of power. 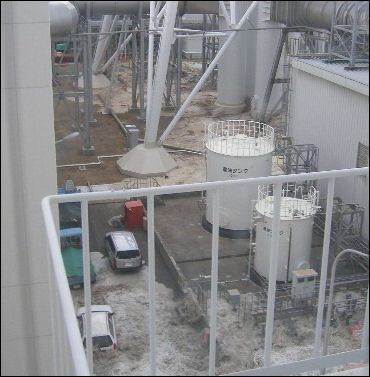 the isolation condensers at reactor unit 1 lost their functionality after the tsunami struck, making it necessary to provide alternative water injection to cool the reactor core. The committee states that, “misjudgment of the operational situation of the IC caused (a) delay in alternative water injection and primary containment vessel (PCV) venting. As a result, an earlier opportunity for core cooling was missed”. Tepco’s off-site emergency response headquarters for example, was housed in a building that “was not designed to withstand elevated radiation levels, although it was intended for use in nuclear emergencies”, and did not even have air cleaning filters, it says. “Tepco did not take precautionary measures in anticipation that a severe accident could be caused by tsunami such as the one (that hit Fukushima Daiichi) … Neither did the regulatory authorities,” the committee states in its report.